Would you ever have imagined that you could golf while sightseeing? 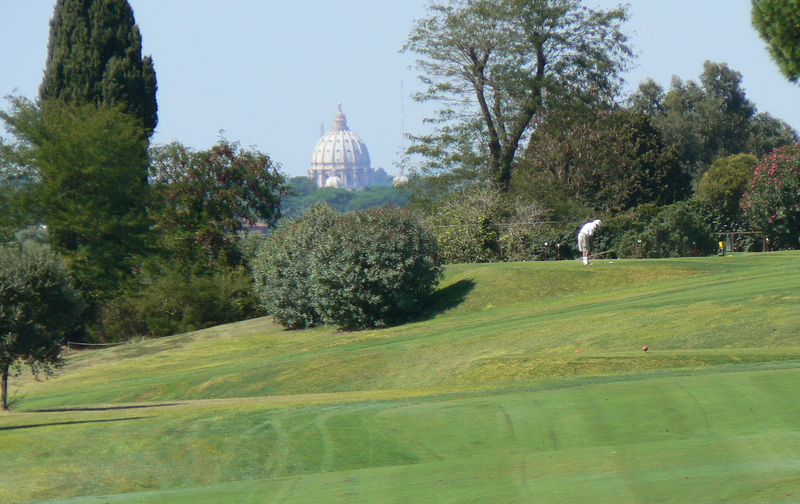 Well, at the historical Acquasanta Golf Club in Rome, Italy’s very first golf club, you can! The golf course is located only 7 miles from the Spanish Steps, and it was originally the property of the Prince of Torlonia. While playing in the golf courses’ beautiful 18 holes you can admire the Claudian Acqueduct, the ancient Via Appia and the Mausoleum of Cecilia Metella. On a clear day, you can ever catch a glimpse of the dome of Saint Peter’s Basilica! In addition to the sightseeing, at Acquasanta you can experience, not only one of the pastimes of Romans today, but also the tradition of golfing that has been kept alive since it’s founding in 1903. The golf course was initially founded by the Anglo-saxon population of Rome, but, in the 20s, more and more Italian members started to join the club, especially members of aristocracy and intellectuals. The course lived a golden period up until the outbreak of World War II which inevitably imposed an air of austerity. The golfers where more and more forced to look out for air-bombers as they played their 18 holes! In 1944, when the war was almost closing to an end, the german forces invaded the area and took over Acquasanta, making it into a military base. Curiously enough, the american forces never decided to bomb the golf course. According to an anecdote, when asked why, the american pilots said that they wouldn’t dream of bombing the only 18-hole golf course to the south of Florence! On the 4th of June in 1944, the American troops set Rome free and, to celebrate, many of the soldiers and officials took up golfing at the club! As you can see, this curious mix of ancient and modern history makes golfing at Acquasanta quite the experience! So when in Rome, why not give it a try?